"We had a large family vacation in Gatlinburg. The cabin was beautiful with lots of room and plenty of things to do. It rained most of the time we were visiting but we were able to entertain at the cabin. With all the convenience of home, we did not have to pack much for the trip. 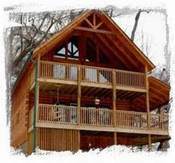 I would recommend this cabin over others in the area. Most other cabins are right next to another with not much privacy. That is not the case with this cabin. There is tons of privacy. We even had a deer outside our window the first morning we awoke on vacation. That was a nice way to start our vacation." This vacation rental has been viewed 9,196 times since 03/23/2009. Each property is independently owned and operated. All listing information has been furnished by the property owner/manager. Please read our disclaimer.